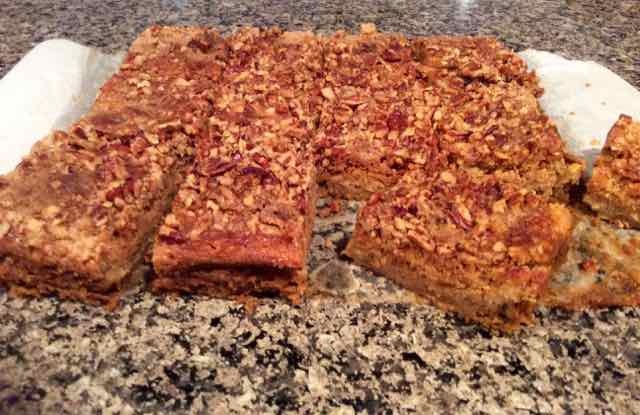 This recipe for Pumpkin Crunch Cake caught my attention. 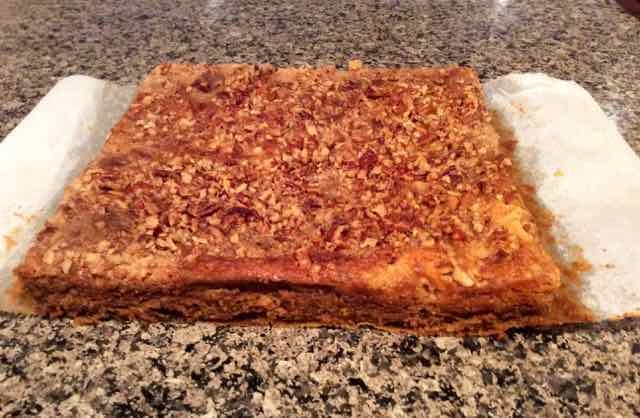 I had never heard of it, but it got some rave reviews so I decided to make a gluten free version. I am so glad that I did. This recipe is a keeper! 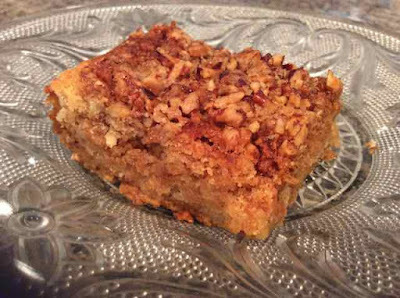 The top is a crumb type cake topped with crunchy nutty goodness and the bottom layer is a creamy and perfectly spiced pumpkin pudding. The combination of the cake and creamy pudding is wonderful. Serving this already delightful cake with a dollop of whipped cream, or ice cream enhances the enjoyment even more. It makes a different and delicious pumpkin dessert that would be perfect for Thanksgiving. The recipe calls for a yellow cake mix. Being a baker, I have a hard time justifying paying large amounts of money for some flour, sugar, baking powder, xanthan gum, salt and shortening that is already mixed together, when, with minimal effort, you can make it yourself with what you have on hand. Also, mixes tend to include mystery ingredients that may or may not be good for you. 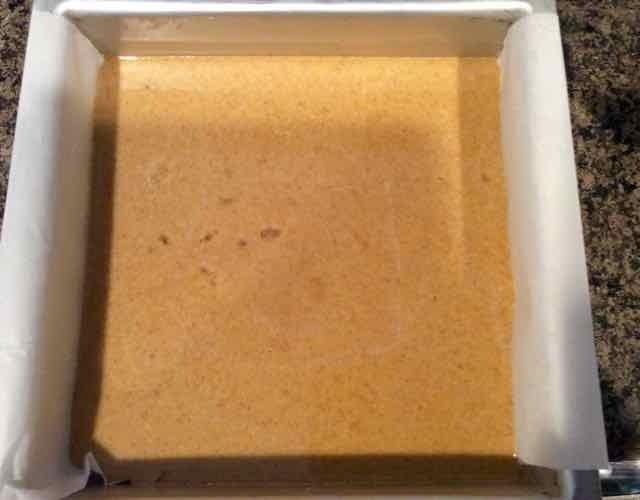 So I made it myself and am posting the recipe for the equivalent of a box of GF Yellow Cake Mix. Of course, you can choose to cut down on time and buy a conveniently premixed box of GF Yellow Cake Mix. I made the cake with unsalted butter and half & half. You can easily make it dairy free by using non dairy creamer and a butter flavored non dairy margarine. Just leave out half the salt in the cake part if you use margarine since margarine has lots of salt in it already. Or I might use half oil half margarine. Or I might use half butter flavor shortening (which is not salted) and half oil and not adjust the salt. I would probably add butter flavoring to any non dairy fat that I used to give it more flavor. I love this cake. Even those who claim not to like pumpkin desserts ate seconds. I hope you enjoy it too. 8 Tbs. = 1 stick = 4oz. 1) Preheat the oven to 350℉. Prepare an 8” square pan by lining it with parchment paper. 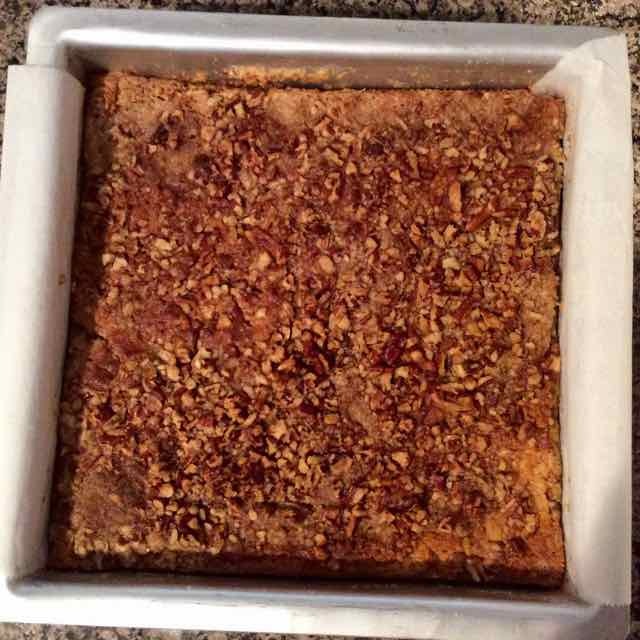 8x8 square pan lined with parchment paper. 2) In a medium bowl add the sugar, salt & spices and mix together. Add the pumpkin, half & half or evaporated milk, egg and egg white. Mix until well combined and pour into the prepared pan. Sugar, salt and spices mixed well. Milk, egg and pumpkin added to the spices. Pumpkin mixture added to the pan. 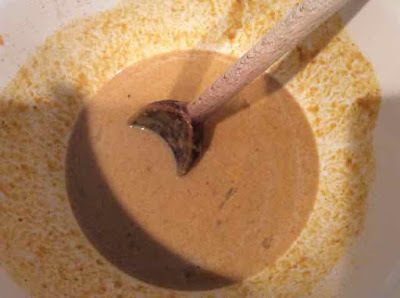 3) Sprinkle 10¼ ounces or half of the dry GF Yellow Cake Mix recipe evenly over the top of the pumpkin mixture. GF Yellow Cake mix sprinkled evenly over the top of the pumpkin mixture. 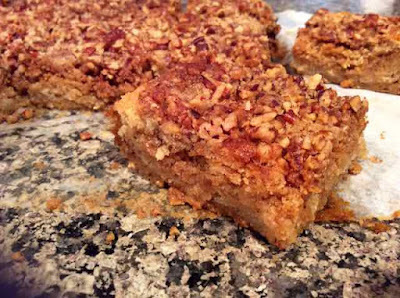 4) Sprinkle the chopped nuts evenly over the dry cake mix layer. Nuts spread over the top. 5) Drizzle the melted butter evenly over the top of everything. Melted butter drizzled over the top. 6) Bake for 50-55 minutes or until the top is golden brown. 7) Cool completely before cutting into squares. The cooled cake is easily lifted out of the pan using the parchment paper. Cooled cake cut into squares. 8) Serve with whipped cream or vanilla ice cream. Unsalted Butter or for Dairy Free use Butter Flavored Shortening that is not hydrogenated such as Spectrum brand. 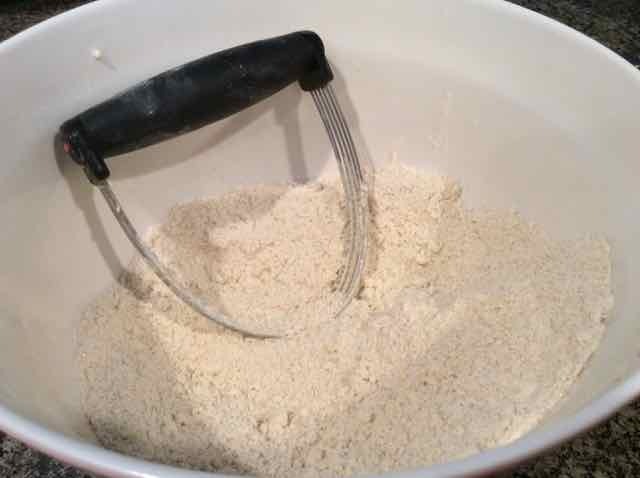 1) Add all of the flours, sugar, salt, xanthan gum and baking powder to a large bowl and whisk together well with a whisk. Dry ingredients in bowl ready to whisk together. 2) Add the butter or shortening and work it into the flour mixture using a pastry cutter or a fork until all the butter or shortening is well incorporated. It should look like sand. Shortening added to the flour mixture. Cake mix after the shortening is incorporated into the flour mixture. 3) Store in a plastic bag or airtight container in the fridge for a few weeks or the freezer for a few months. 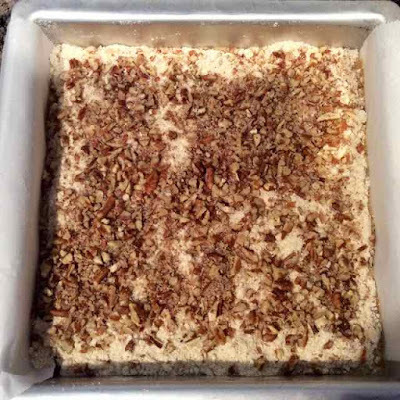 GLUTEN FREE PUMPKIN CRUNCH CAKE RECIPE FROM SCRATCH GlutenFreeBakingBear.com INGREDIENTS ½ box or ½ recipe (see recipe below) = 10¼ ounces Gluten Free Yellow Cake Mix 1 cup Canned Pumpkin 6 ounces = ⅔ cup Half & Half or Evaporated Milk 1 whole + 1 white Large eggs 6 Tbs. Sugar - I used evaporated cane juice crystals ¼ tsp. 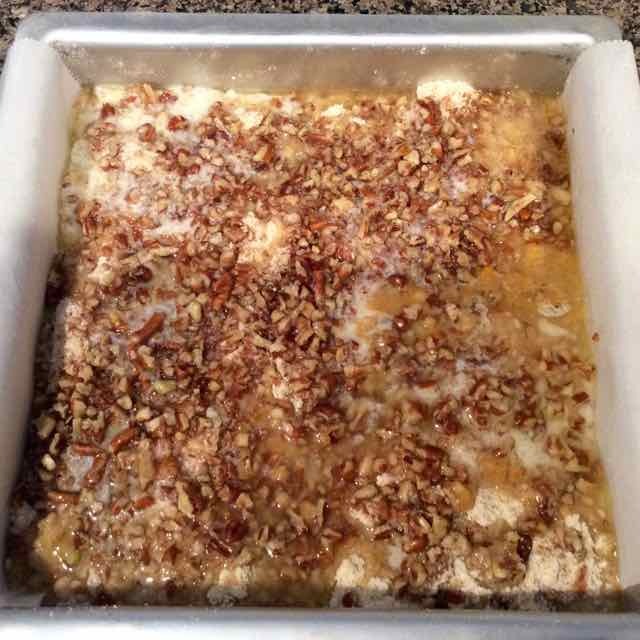 Himalayan Sea Salt ½ cup Chopped Pecans and or Walnuts 8 Tbs. = 1 stick = 4oz. Unsalted Butter - Melted DIRECTIONS 1) Preheat the oven to 350℉. 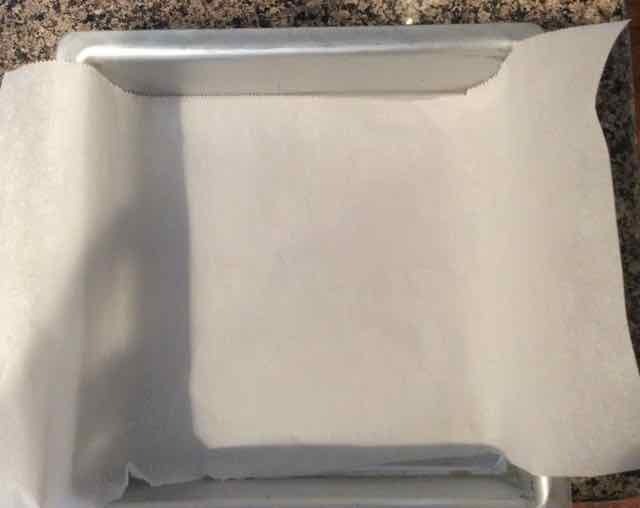 Prepare an 8” square pan by lining it with parchment paper. 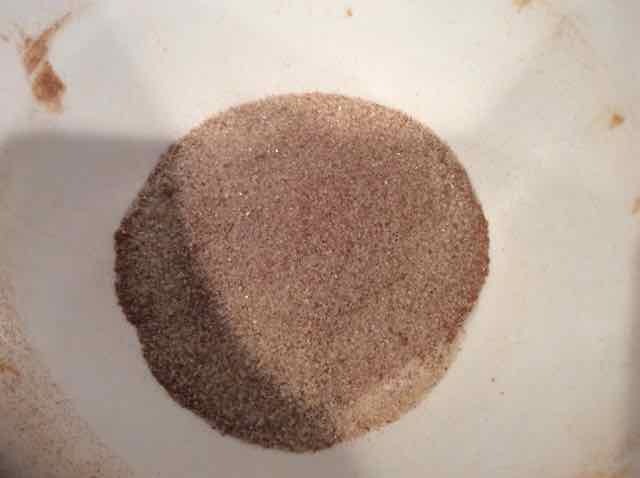 2) In a medium bowl add the sugar, salt & spices and mix together. Add the pumpkin, half & half or evaporated milk, egg and egg white. Mix until well combined and pour into the prepared pan. 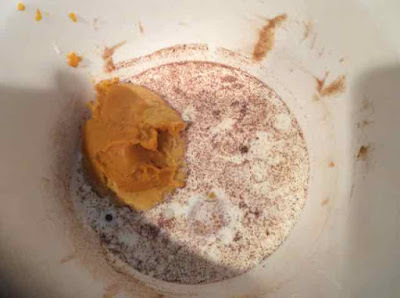 3) Sprinkle 10¼ ounces or half of the dry GF Yellow Cake Mix recipe evenly over the top of the pumpkin mixture. 4) Sprinkle the chopped nuts evenly over the dry cake mix layer. 5) Drizzle the melted butter evenly over the top of everything. 6) Bake for 50-55 minutes or until the top is golden brown. 7) Cool completely before cutting into squares. 8) Serve with whipped cream or vanilla ice cream. 9) Refrigerate leftovers. 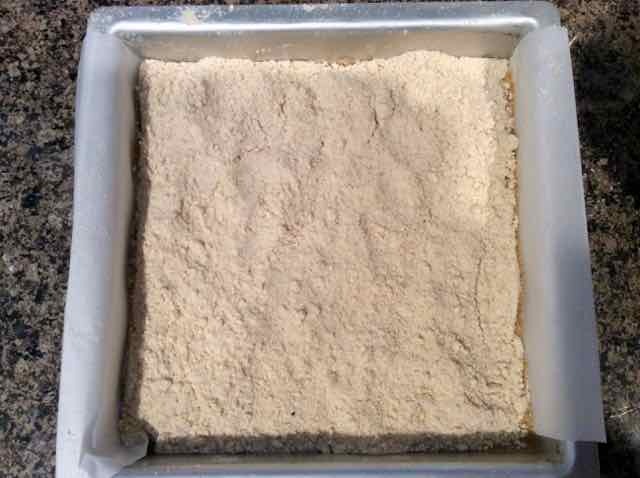 GLUTEN FREE YELLOW CAKE MIX 1 ¼ cup Sorghum Flour ½ cup Tapioca Flour ½ cup Chickpea Flour ¼ cup Coconut Flour 1 cup Sugar - I used evaporated cane juice crystals 4 tsp. Baking Powder ¾ tsp. Xanthan Gum ½ tsp. Himalayan Sea Salt 4 Tbs. Unsalted Butter or for Dairy Free use Butter Flavored Shortening that is not hydrogenated such as Spectrum brand. 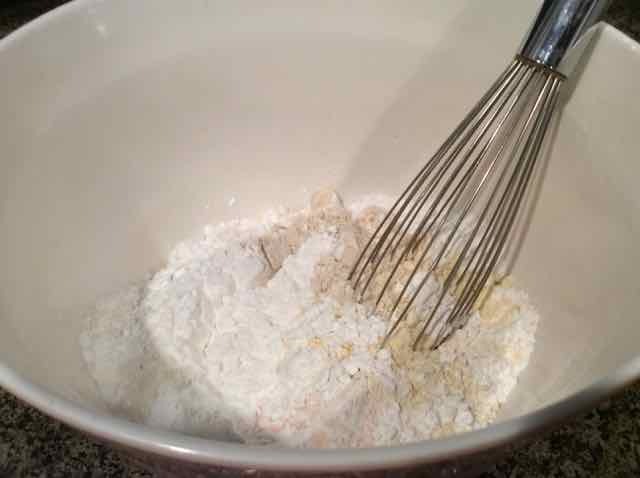 DIRECTIONS 1) Add all of the flours, sugar, salt, xanthan gum and baking powder to a large bowl and whisk together well with a whisk. 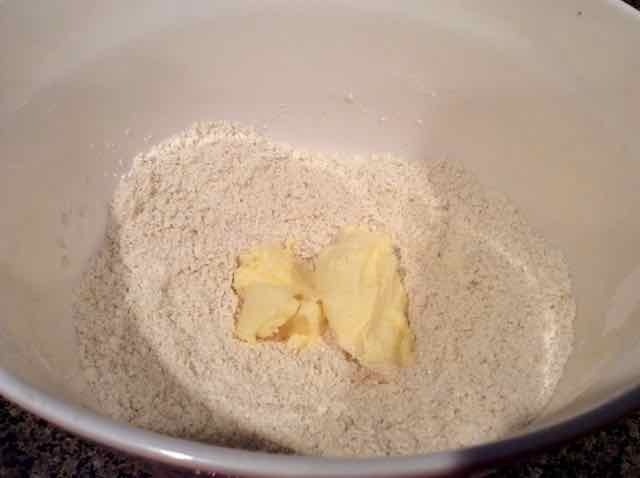 2) Add the butter or shortening and work it into the flour mixture using a pastry cutter or a fork until all the butter or shortening is well incorporated. It should look like sand. 3) Store in a plastic bag or airtight container in the fridge for a few weeks or the freezer for a few months.